This candy bouquet DIY is crazy easy to make. Plus it is super fun to make for Valentine’s day but really you can make it for any occasion. This is a simple candy gift basket idea that you can throw together and really make someone’s day. Grab their favorite candy and put it all together in a bright and festive candy bouquet. 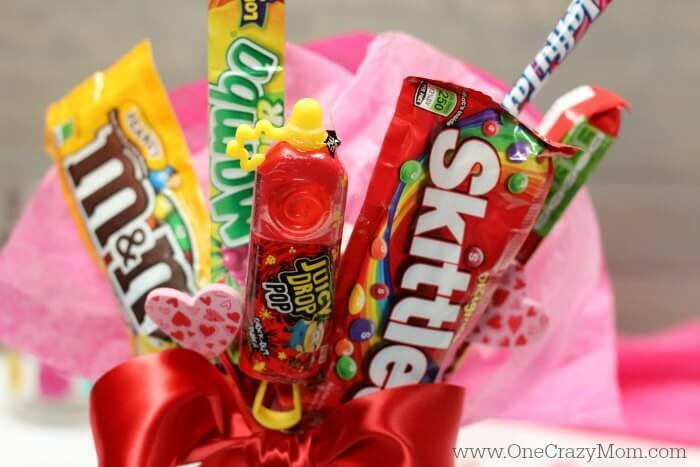 What do you need to make a candy bouquet? You only need a few simple items to put together a candy bouquet sure to be a hit. 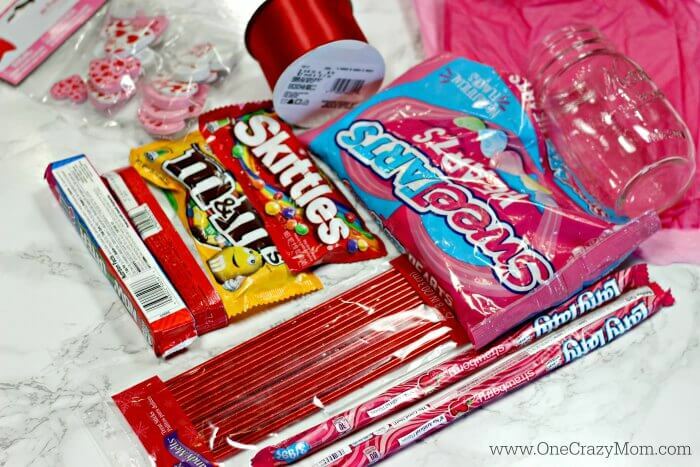 Grab all of their favorite candy in various sizes, candy hearts, ribbon and a mason jar. Easy! How to make your own candy bouquet? It is so easy and all you do is attach your candy to Wilton treat sticks or you can use straws or lollipop sticks. Once you have everything glued together, it all gets tucked into a mason jar. Now, candy arrangements are awesome, but you don’t have to just use candy. Think outside the box! How to make a candy bouquet in a cup? If you prefer not to use a mason jar, a cup would work just as well. Grab a cup and put the candy inside just as you would the mason jar. What are some other candy bouquet ideas? 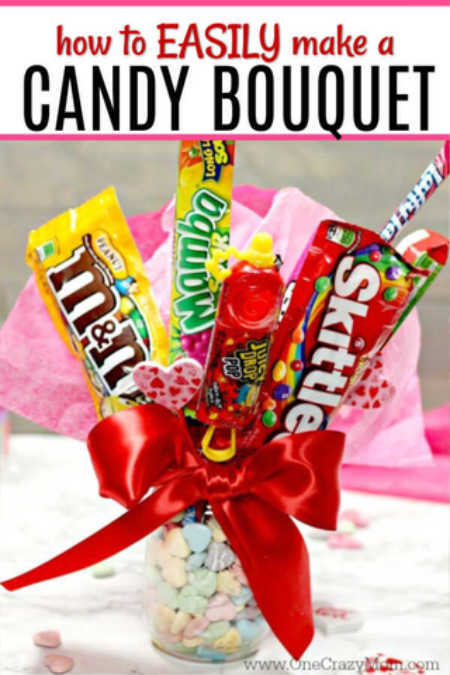 You can do all sorts of ideas for candy bouquets. We make these all year round and they are always so well received. You can do a snack basket, a chip basket, a movie basket, or even a beef jerky basket. College kids love getting a snack bouquet DIY for a gift! I did a Facebook live video showing you how to make this easy candy bouquet, and several readers came up with some awesome ideas. How to make a birthday candy bouquet? We love making candy bouquets for birthdays. You can follow the same instructions to easily make these for birthdays. I like to use tissue paper in their favorite color and I have even tucked in a small balloon on a stick in the mason jar. It looks so festive. Make sure you take a minute and watch it for more ideas! Let’s learn how to make a candy bouquet with tissue paper! First fill your mason jar about a third of the way with your candy hearts. These are going to keep the sticks in place. Next add a bead of hot glue down the back of one piece of candy. Push in one treat stick and allow to dry. Continue to do this with all of the candy. Once the hot glue is dry begin sticking them into the mason jar with candy. Begin adding in more of the loose sweet tarts in the mason jar to help keep the sticks in place. Make sure the mason jar is completely filled with candy one you have placed your candy where you want them. Once finished push in some tissue paper in the back to give the arrangement a background. Then cut a piece of ribbon and tie it around the mason jar. Finally give your new candy gift basket to someone you love! They will love it. Note- You can use a small piece of floral foam in the bottom of the mason jar so that you do not have to use so many candy hearts if you prefer. Everyone will love this easy candy bouquet! They make great gifts and such a fun way to give candy and other snacks. We make these frequently and everyone just loves them. In fact, some people hope to get one every year and seem to really look forward to these DIY Candy bouquets! 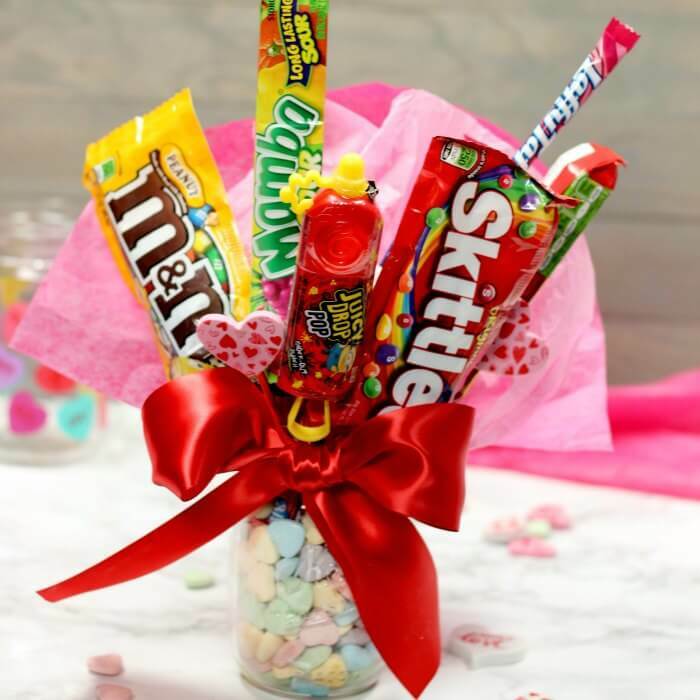 Now that you know how to make candy bouquet gift baskets, you will love making them for all occasions! 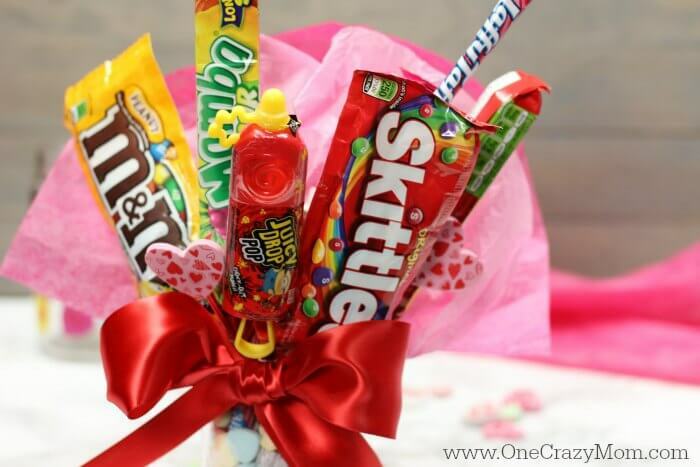 If you need a gift idea, try making a candy bouquet. Turn someone’s favorite candy bar into a great gift they are sure to love. There are so many Chocolate Bouquet ideas diy to try. A DIY Candy Bouquet would be perfect for a teachers gift, fathers day and much more! Make a Dollar Tree Candy Bouquet for a frugal gift idea! No need to look for a candy bouquet near me when you can make one yourself for a fraction of the cost. Make your own candy arrangements today! This is such a great idea and can easily work for anyone on your gift list. You can try different color combinations, candy, snacks and more. A candy bouquet can be modified to work for just about anyone. It is a great gift, budget friendly and easy to put together! You can even let the kids help! It would be so fun to bless someone with a candy bouquet and the kids can get involved. Let them help pick out the candy or snacks. They also can help deliver the bouquet. Such wonderful memories plus the kids will learn about showing kindness toward others and cultivating a giving heart. I love activities that are easy to make, create memories and become a teachable moment. 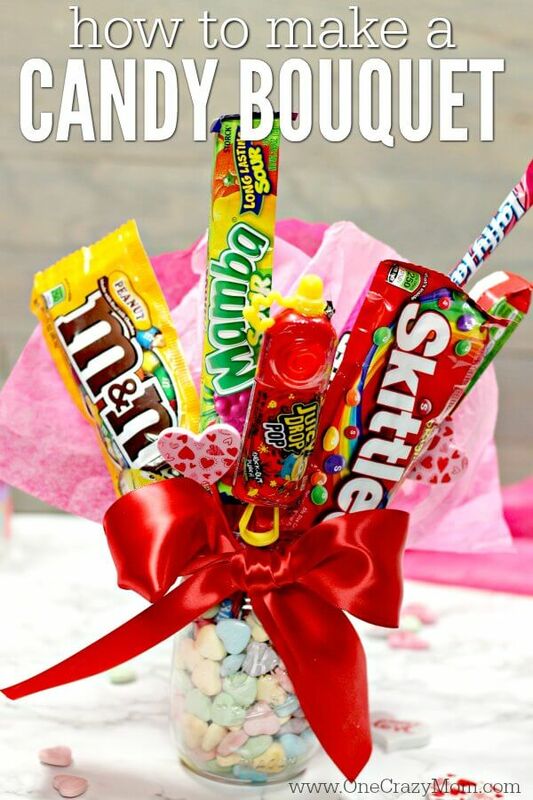 Please share with us any ideas you have and what type of candy bouquet you plan to make! Learn how to make a candy wreath that everyone will love. This easy candy wreath is so fun and a great gift idea for any occasion.